Around a quarter of untreated lung cancer patients in England are to get access to Merck, Sharp and Dohme’s Keytruda, a decision which is a major market breakthrough for the company. However, NICE says the cancer immunotherapy should be reimbursed by the Cancer Drugs Fund (CDF) which means it will have to prove its value, either through further clinical trials or real-world data generated through the CDF. NICE had rejected Keytruda (pembrolizumab) in first line non-small cell lung cancer (NSCLC) in draft guidance published in March. But MSD has agreed a confidential discount with the Department of Health opening the way to its use on the CDF, a time-limited period, after which it will be given full reimbursement or lose all funding. 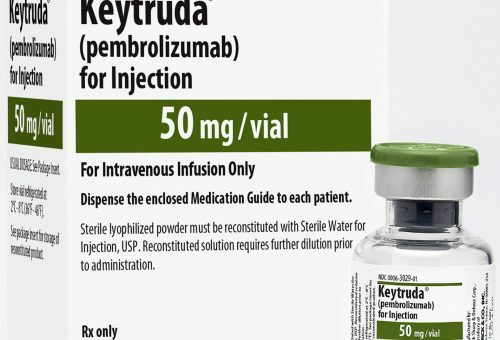 The decision is a major breakthrough for MSD in its attempts to make Keytruda a first line treatment for lung cancer, and puts it way ahead of rival immunotherapy drugs. NSCLC is the second biggest cancer market (behind breast cancer) in terms of numbers of patients, with 46,000 new cases diagnosed in the UK in 2014. Only patients who have tumours with 50% or more PD-L1 expression will be eligible, after the NHS began testing for this mutation in April. To be eligible for treatment, patients must also have no epidermal growth factor receptor (EGFR) or anaplastic lymphoma kinase (ALK)-positive mutations. Health secretary Jeremy Hunt and NHS England’s Simon Stevens have acknowledged the potential of immunotherapy to improving survival times – but have also confessed their fears for the impact on limited NHS budgets. Routing this use through the CDF postpones a funding decision for around two years, as it has its own budget of £340 million. Funding for the treatment will also be stopped after two years of uninterrupted treatment and no documented disease progression, as NHS England had been wary of patients staying on the costly treatment for much longer. This means a quarter of first-line NSCLC patients will be eligible for treatment, a move which will transform how the disease is treated. NICE says current evidence suggests Keytruda can extend overall survival by around three months on average, but says a more exact figure is unclear based on data from the KEYNOTE-024 trial. Longer-term data from KEYNOTE-042 trial is due in February 2018, which could help prove it extends lives further. There will be a further data analysis from KEYNOTE-24 later this year, and these data could provide the certainty required by NICE to recommend routine use on the NHS. First line NSCLC use is the biggest prize in immunotherapy, and Keytruda’s rivals, Bristol-Myers Squibb’s Opdivo and Roche’s Tecentriq, have both suffered setbacks which have consolidated its lead. NICE has delayed final guidance on second line use of BMS’ Opdivo in second line NSCLC pending negotiations over price, and the drug failed to show efficacy in first line use in a late-stage trial. Other companies developing cancer immunotherapies are also targeting first-line NSCLC as it is an indication worth billions of dollars: AstraZeneca is due to unveil data from its durvalumab and tremelimumab cancer immunotherapy combination in the coming weeks. It’s unclear what funding arrangement will be made in Wales or Northern Ireland, which usually follow NICE rulings but have no CDF, or equivalent arrangements. The Scottish Medicines Consortium is to publish a decision on Keytruda in first line NSCLC in July.